Sometimes, the hardest thing about blogging is getting started. What should I write about? Will my readers enjoy it? How will I get people to view my post? These are all questions that I’ve asked myself many times when planning blog posts. I imagine many of you had also had some of these questions. Here is my most streamlined way to answer them all! This is probably the most important part of creating a blog post. As the writer, you need to write about topics that interest you because you will be able to produce better content since you won’t be bored! Think back to the school days. Which essays did you put the most effort into? Probably, the ones that you enjoyed the most. For me, when I’m writing about something I enjoy, I go into way more detail. I also can write on and on for many paragraphs without thinking twice. But, when a topic isn’t something that is as enjoyable, each paragraph just seems to drag on and the flow is lost. Now the flow is very important not only for you as the writer, but also for the readers. You need to keep your readers engaged. Readers will follow something that they enjoy. Chances are good that if you didn’t enjoy writing your blog post that the readers will not enjoy reading it either. You want your readers to enjoy reading your post just as much as you enjoyed writing it, so pick something you are passionate about. This step is a very easy step to skip, but don’t skip it! This is how you will get your post out there to future readers. You’ve most likely heard the term ‘SEO’ or ‘Search Engine Optimization’ in your blogging adventures. 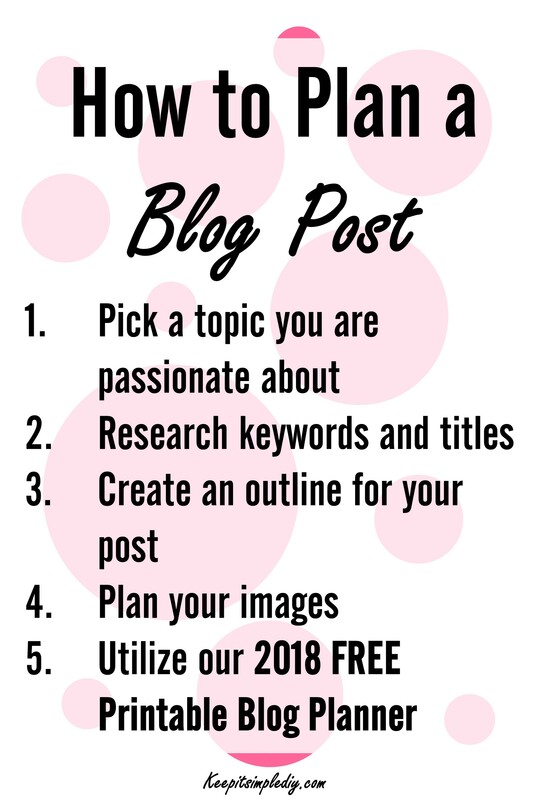 These terms can be extremely overwhelming and can make it seem virtually impossible to get your blog posts out there. But, I assure you, it is not impossible. So, let’s talk about SEO in the most easy to understand way. As a blogger, you want readers to be able to find your blog posts in ways other than through a direct link that you post. Readers can find posts multiple ways such as Pinterest, Google, Youtube, and other websites such as Yahoo or Bing. All of these websites are search engines. Readers use search engines to find information that they are interested in. To find this information, they enter a keyword or a phrase into the search field. This could be anything. Let’s say I wanted to find the funniest cat videos online. I could go to any of the search engines and type ‘funny cat videos’. Each of the sites would bring up a variety of results and not necessarily all the same results. Each search engine is different. The goal is for you to get your post to be at the very top of the results or as close to the top as it can get. The closer to the top of the list, the more views your post will get. In order to get yourself on the right track to get to the top of the list, you have to post what people want to read. Take the topic that you had chosen in step 1 and type it into one of the search engines listed above but don’t hit enter. Do you see any suggested topics pop up as you start to write? These are popular topics that people search for. You could also take it a step further and use the keyword planner from google to pick keywords that you would like to write about. I suggest writing about keywords that have low competition. This way, you will be more likely to rank on the first page. Note that Google Keywords Planner is meant for optimization on Google and not the other search engines. Create an outline for your post that will keep your readers engaged. Plan to keep your paragraphs relatively short and keep the flow moving. Drafting the outline of your post can be as simple as making a graphic like the one I have at the top of this post. The main idea is write out all of the main points you want to touch on in your article and organize them in a way that flows well. Again, you want to keep your readers engaged, so be sure to keep the transitions easy to follow. Every great blog post will have at least one image, and not just any image. Your image has to draw the attention from your readers. It can do this by the design of the image or the information the image provides. Either way, the image needs to be engaging. There are many ways to create images for your blog post. I personally prefer to make my images in PowerPoint because I find it very user friendly. Yes, you heard it right! 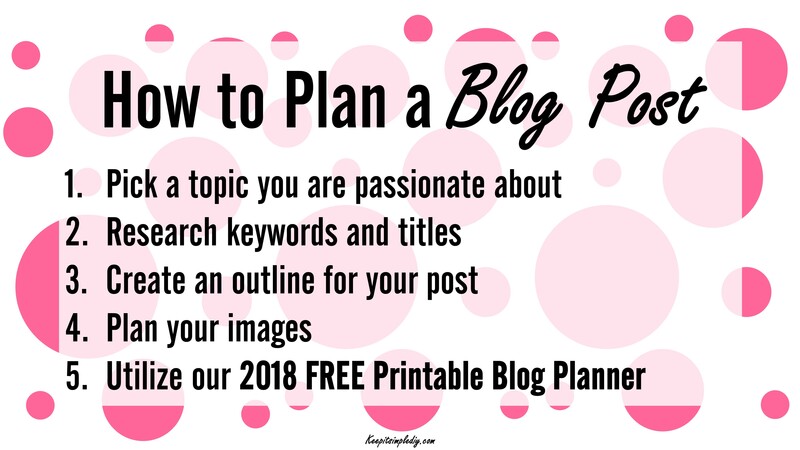 Keep it Simple, DIY has a FREE blogging planner! Subscribe to gain access to the blog planner and new blog posts by clicking on the image below. We also have an Enhanced 2018 Blogging planner with some very cool additions! The Enhanced blogging planner can be found at Etsy. If you have any suggestions for additional pages in the planner, let me know! Thanks for the blog planner. It is a good way to think about being more strategic about posts and SEO. Sometimes, I just write! The planner is so valuable. Thanks for the tips as well. Oh!! This is exactly what I need to keep me straight. Thank you for this printable planner. I needed one! This looks like a fun printable planner! I love the rainbow colors! I need to get better at planning my blog posts, so thanks for the tips and resources! Oh yay! Thanks for creating this planner. I really didn’t have the time to create one myself. I appreciate it! Thank you for the planner. Something out there that I might actually use! Planning for a blog post helps so much. it also keeps you from being lazy in completing it in time. Organization is so important here, great post. Loved reading it!! !